reverberation: Google Adsense or Load of Nonsense? Yeah. Adsense, man. No, nonsense, what? Or, just no nonsense adsense. Who knows? Dug the spaghetti picture though. Way cool. And don't forget, The Fish Won't Wait. Yeah. But hey man, The Fish Won't Wait. 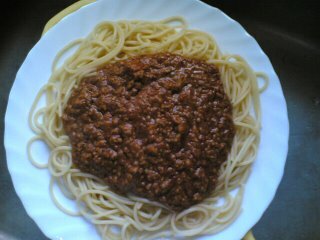 Mmmm Good old Spag Bol! The most British of culinary delights, well after vindaloo that is. Thats a very well presented plate of Spag Bol, can we have a photo of your shirt when you finished it? Unfortunately there are no photo's of a shirt as I did the decent Yorkshire thing and took my vest off to eat it.